Helping Hand USA, ICNA Relief Canada and UKIM. They allocated 254 cows and 220 goats in 41 districts for Qurbani project purpose. Under Qurbani Program money spent for buying 254 cows and 220 goats. 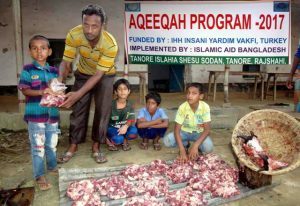 Qurbani animal was distributed among the orphans and needy people. In 1990 by a historical background, Islamic Aid Bangladesh started its journey. Facing many hindrances, the present Islamic Aid Bangladesh entered into 28th year of journey. With the guidance of the higher authorities, with the careful eye and effective management of the Executive committee, firm determination of the members and the sincerity and co-operation of the staffs and above all with the blessings of Allah Islamic Aid Bangladesh is running forward to achieve the goal facing all obstacles.